Meghan Markle joined Harry and her future in-laws at a charity event marking the quartet's first public appearance together. American actress Meghan Markle joined forces publicly for the first time with her future in-laws, the Duke and Duchess of Cambridge, along with her future husband, Prince Harry, at an event Wednesday showcasing royal charity work. 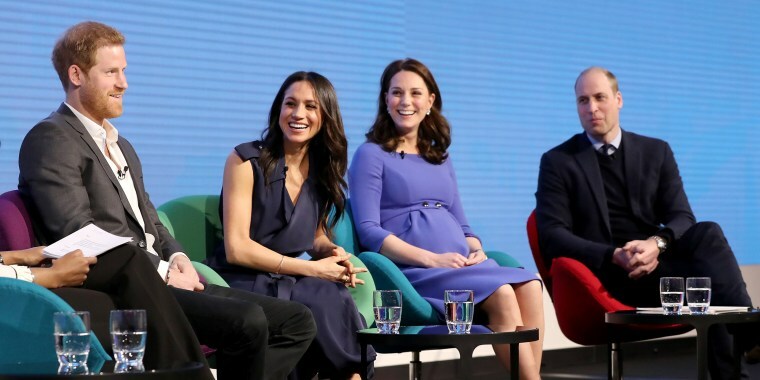 The newly dubbed "Fab Four" gathered on a London stage at the inaugural Royal Foundation Forum to showcase projects headed by the philanthropic venture set up in 2011 by Prince William and Prince Harry and later joined by Duchess Kate after she became a part of the royal family. The event marked the first time Markle joined the trio in a public engagement. "Catherine, Harry and I are delighted to be here this morning and we’re particularly happy to be at our first Royal Foundation event with Meghan," Prince William noted in his opening remarks and before yielding questions from a moderator. The event brought together representatives from various Royal Foundation initiatives, including its mental health campaign, Heads Together, Harry’s Paralympic-style sporting event, Invictus, and the conservation group, United for Wildlife. Markle will officially become the latest patron of the organization after her May 19 wedding to Prince Harry on the grounds of Queen Elizabeth's Windsor Castle. The pair, who announced their engagement last November, have spent the past several months touring the United Kingdom and meeting with organizations close to Prince Harry’s heart. Markle said she found it “incredibly exciting” to work with the Royal Foundation, and said she plans to “hit the ground running” after her wedding. Markle, who quit her acting career after her engagement, has a history of charity work that has primarily focused on women’s rights in third-world nations. At the forum, she voiced support for the Time’s Up and Me Too movements and other efforts to empower women. While Wednesday's event marked the first official joint appearance of both couples, the quartet were previously photographed together on Christmas Day as they left a morning church service at the queen's Sandringham estate. Both William and Harry acknowledged that working so closely with his loved ones has led to “healthy disagreements” over how to best guide the foundation’s work.